I baffles me when I read such headlines. 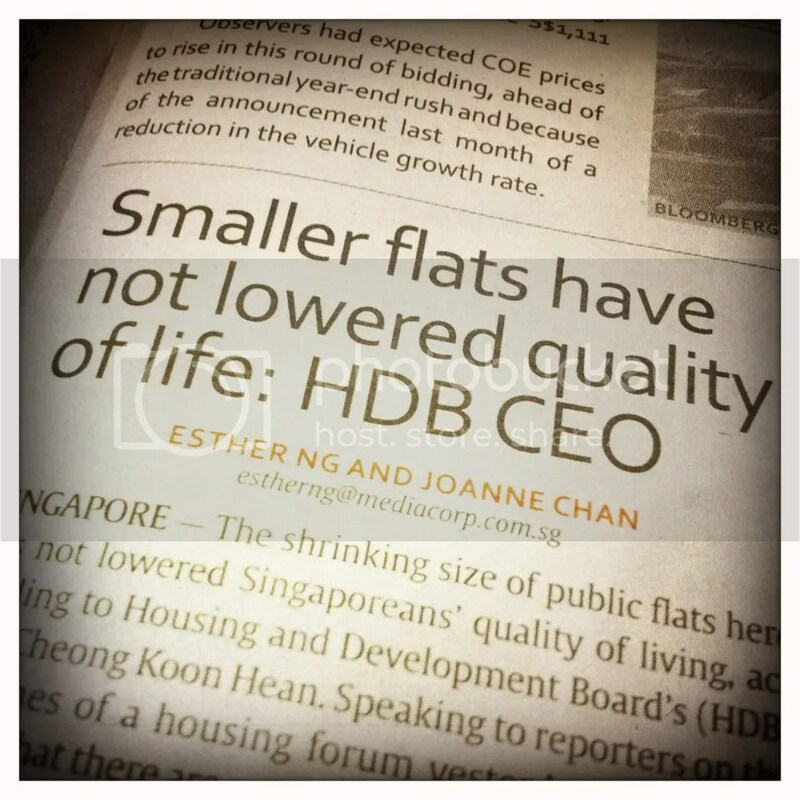 Does Dr Cheong-Chua Koon Hean live in a smaller flat? Does she know what it is like to live in a smaller flat? Has she ever tried to decide which to give up, a bed or a wardrobe because the room is big enough only for either? If she does, that’s great. If she doesn’t, such statements make the general populous ever so slightly irritated and the marginal who have no choice but to buy smaller flats actually angry. Honestly, people with the luxury of choice should not comment on the lives of people who do not. Least of all make assumptions. It’s simple, let’s just walk the talk. Even if it’s temporary, I wanna see our leaders be prepared to swap their houses for smaller HDB flats and take our public transport system to work. Some will say their jobs are stressful and shouldn’t be subject to it. Have you tried raising a family of 4 on SGD2500, have one of them suffer a major illness? The stress level, I’d reckon isn’t very dissimilar. Some will argue that’s your child, it’s different. I dare say, as leaders of the nation, you sure as hell have the heart for the country and fellow countrymen like you do for your children, if not, you’re not quite suited for the vocation. Everyone is different and I’m sure there are different sides of the arguement. All I’m asking is this, before you make a comment about the lives of Singaporeans, you would be so much more credible if it wasn’t an assumption and you’ve walked the talk. Swap your home for a smaller HDB flat for a year and if your quality of life hasn’t suffered, I’m prepared to reconsider my plans for my family and buy one of those new HDB flats where the third bedroom is half the size of my HDB childhood bedroom. I love you Carl, the voice of reason and common sense. Aaawwwww M, right back at you, babe 🙂 Thank you for keeping my blog on your reading list. Miss you! !